In 2013 the National Federation of the Blind was the recipient of a three-year grant award from the National Science Foundation to expand informal science, technology, engineering, and math (STEM) opportunities for blind youth, a project that saw the NFB partner with six science centers across the country as well as with other educators and STEM professionals. As part of that work, we introduced our student participants to tactile technical drawing (or drafting) as a component of an engineering design project. Together with our partners we noticed a trend among our students and realized there was an opportunity for an exciting new project focused on a set of skills commonly referred to as spatial abilities. Fast forward to 2017, and we were fortunate that the National Science Foundation recognized the merits of this idea and awarded the National Federation of the Blind a new five-year grant focused on spatial ability and engineering education for blind high school students. Think of spatial ability as the way in which you imagine an object, its various characteristics, and then mentally manipulate that object to consider how it might change under certain conditions or as the result of certain actions. 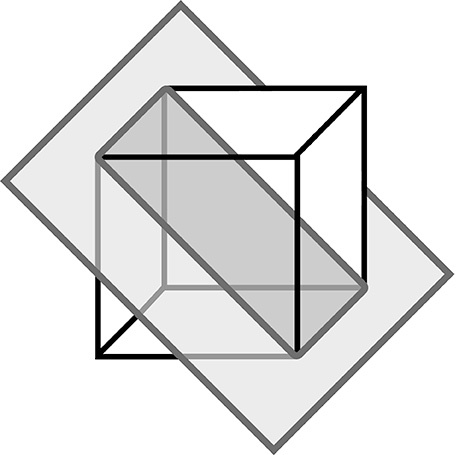 An example of this is if you consider a cube, and then you think of how its two halves would appear if it were cut in half at a forty-five-degree angle, and how those halves would appear based on the angle of perspective. You can imagine how valuable this ability is within engineering specifically, but also its broad application in a variety of fields and in daily life. Consider how helpful it can be to picture how your various belongings—with their varying shapes and sizes—will fit in your luggage before you pack, unpack, and inevitably repack just about everything you own. Another application of spatial ability is an individual’s concept of place within his or her environment. Again, this is an important skill for anyone, regardless of vision or occupation, but even more so when you consider the importance of mental mapping in orientation and mobility training for blind children and adults. For anyone, blind or sighted, who has become turned around in a busy mall or convention center, recalling the layout in your mind is a useful and comforting ability. The impetus for our project is our understanding, based on some existing literature but also informed by the collective experience of the National Federation of the Blind, that blind youth are denied many of the opportunities to develop spatial abilities to the same degree and at the same time as their sighted peers. Active play, independent travel, and other age-appropriate milestones can influence the development of spatial abilities. We are all too familiar with the obstacles blind youth face due to low expectations. Our work will include research, led by our partners at Utah State University, to determine how spatial skills can be measured and improved for blind people. The programs themselves may sound familiar to you. We will be holding multiple iterations of NFB Engineering Quotient (EQ), a week-long program for blind high school students to experience hands-on engineering activities alongside blind adult mentors. Our colleagues at Utah State University are experts in engineering education and have worked with us in the past to develop programming for blind youth. Similarly we will once again be working with our friends at the Science Museum of Minnesota who will lend their expertise in informal programming. Ann Cunningham will be leading lessons on tactile drawing. In collaboration with our other partners, she will showcase how integral this skill is for engineering specifically and how useful it can be in any class or profession. All of this will of course take place within the context of the National Federation of the Blind and its fundamental knowledge that you can live the life you want; blindness is not what holds you back. With this basic principle the organization has affected thousands of lives, primarily through a system of mentorship that has become second nature to us. In academia there’s a name for what we’ve been doing, and it has been shown to be effective in trials and investigations with a variety of populations. Known as “communities of practice,” a lot has been written about them, but the basic idea is that a group of people who share a concern or passion come together to address their common issues collectively—as a community. The expertise of this group comes from practice, from the lived experiences of the members of the community. Sound familiar? As new members enter the community, they are mentored by those more experienced members who came before them, in time becoming those who will mentor the members to come. Our partners at Lifelong Learning Group, evaluators on our previous grant from the National Science Foundation, have joined us once again and will be producing research on the impact of the National Federation of the Blind as a community of practice on the blind youth participating in the coming years of programming. It is an exciting opportunity to document the mechanisms and processes by which the National Federation of the Blind truly changes what it means to be blind and does so in a way that speaks the language of academia—an important audience if we are to reach those who so intimately influence educators before they come into the classroom. We are excited to announce this new exploration into a STEM field and into what makes the National Federation of the Blind so effective. You will hear much more about our work over the coming years in this publication and in others, as well as at upcoming conventions (both our own and in the wider world). For now, if you’d like to learn more about the program, be sure to visit www.blindscience.org. Over the years more information will be added, and we will provide links to other resources including publications resulting from our research.